No matter what your formal wear needs are, Dress 2 Impress carries a wide selection of styles, cuts, and colors to ensure that you'll find the dress that is perfect for your occasion! 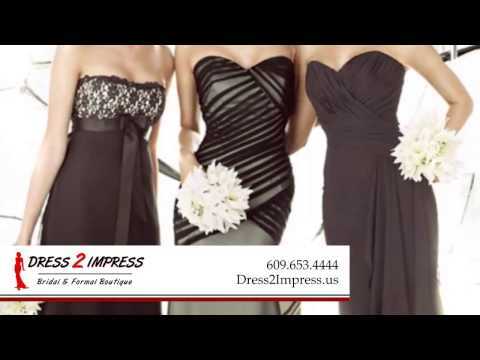 Dress 2 Impress - Bridal & Formal Boutique offers high quality Bridal gowns, Bridesmaid dresses, Mother of the Bride dresses, Flower girl dresses, Formal wear including Prom dresses, Pageant, Cocktail and Evening dresses. We are also one of the premier bridal shops in New Jersey and carry an incredible selection of bridal gowns and accessories. Because our focus is on formal-wear, and just formal-wear, you know that you are getting the best quality merchandise available. We're not cutting corners or simply looking for volume. We only stock quality gowns and dresses that we know our customers will love. We are an authorized retailer for the following Bridal Designers: Paloma Blanca, Mikaella Bridal, Moonlight Bridal, Moonlight Couture, Val Stefani, Ellis Bridal, Jasmine, Impression Bridal, Wtoo and Watters. Dress 2 Impress only offers high quality 100% genuine products. We have selected the following designers for our formal dress selection: Terani Couture, Angela & Alison, Riva Designs, Kasey J, Xtreme Prom, Xcite Prom, Disney Forever Enchanted, Lime by Riva Design, Colors Dress, Miss Masidon NY, Andrew Adela, Ambiance, Jessica Lynn and more. The day you walk down the aisle is one of the most special days of your entire life, and everything leading up to it should feel just as special. At Dress 2 Impress we provide all our brides with individual attention and personalized service to make choosing your dress an unforgettable experience. Our caring, friendly staff is here to make sure you look your very best on your special day. You'll be beaming on your wedding day thanks to all of the individual attention from Dress 2 Impress. Please visit our web site for more information and to set up an appointment for a personal consultation! Amazing place, amazing people, amazing service! I highly recommend Dress 2 Impress to all of my friends! I love my dress! What a service! I have never been treated like a royal customer before! Those ladies at Dress 2 Impress did beyond any expectation! That day we went to several shops in the same area, and no one can compare! I was able to look and select my own choices and try as many gowns I wanted! The ladies wanted me to be happy. And I did, I have found the most stunning gown that I had ever dream off! Can't wait to wear my dream dress at my wedding! Thank you Dress 2 Impress! Prior to visiting Dress 2 Impress I was having such a difficult time finding that perfect dress. I was starting to panic and stress over finding a dress in time. Melissa worked ever so patiently with me as we tried on dress after dress. She picked up on my style immediately and between her, Bennie, and the amazing touches from Violet I found my perfect dress. Since I wanted to accentuate my dress with black, the girls were coming up with one idea after the next in order to incorporate the color perfectly. They even went out of their way to show me how the ideas would look on the dress in order to visualize it better. I had an amazing time with them, laughing throughout the day and before I knew it I had spent 4 hours in the store (I have never spent more than 60 minutes in a store before, ever). These girls are such an amazing team and anyone who walks through their doors will have an incredible experience and most likely will find their perfect dress. Love them!!! I went there yesterday after seeing a dress on The Knot. I live 2.5 hours away from the store, but couldn't find the dress anywhere closer so my mom and I decided to make the drive down. So glad we did! The staff was so nice and helpful! The dress I had seen online was the first one that I tried on and actually wound up buying. The amazing staff also helped me choose a veil and tiara that matches the dress perfectly. They explained the ordering process so clearly - scary when you are paying that much for a dress and won't get to see it for 4 months! LOL. They even popped open champagne and had a toast with my mom and I when I had decided that this was the dress. Amazing experience! From the moment I walked into the store, the entire Dress 2 Impress team made me feel so welcome. I could tell just how excited they were to help me find my dream wedding dress. I found my wedding dress and all of my accessories at Dress 2 Impress, and all of the alterations on my dress were done there as well. I even rented all of the tuxedos there, too! I couldn't be happier with my experience at Dress 2 Impress, and I highly recommend this boutique to anyone looking to find her dream wedding dress and have a wonderful experience while doing so! Look Who Said YES To Her Wedding Dress!